NVTBL’s Premier Showcase League (PSL) focuses on exposing players to college programs and their campuses. The Bradley Eagles All-Academic PSL team takes that approach a step further. Members of the Eagles’ All-Academic team are some of the best student-athletes in the area and are committed to excelling on the diamond as well as in the classroom. Founder Andy Bradley designs the program's college recruiting process around exposing his players to schools with academic curriculums better suited for their needs. The Eagles will visit, tour and meet coaches from schools in New England, Virginia, Pennsylvania, Maryland and North Carolina throughout the year. This past June, the All-Academic team visited and toured over 18 schools across the northeast including Yale, Harvard, Columbia, Haverford, Swarthmore, Wesleyan, Stevens Institute, University of Pennsylvania and New York University. Over the summer months, the Eagles will tour more than 30 high academic college campuses from the Ivy League, Atlantic Coast Conference (ACC), Patriot, Centennial, Landmark and New England Small College Athletic Conference (NESCAC). On these visits, the players will also run pro-style workouts in front of college coaches and have the ability to ask them questions about their school and program. Since the Bradley Eagles were founded in 2011, over 60 players from the program have gone on to play college baseball. Bradley focuses on finding the right fit for his student-athletes based on their requirements and where they are athletically as well as academically. Michael Janis, a senior at Churchill High School, traveled and competed with the All-Academic team this summer wanting exposure to higher academic schools while still showcasing his talents as an outfielder. "We weren’t just going to the schools and walking around, we were really evaluating them and talked about what we liked and what was different," Janis said. "It was great to be on a number of different campuses and meet coaches and students." Janis is a dual-sport athlete and currently holds a 4.0 GPA with a 33 on his ACT. This fall, Janis has led Churchill’s football team to a 7-1 record as the team’s quarterback and is looking at opportunities to play either sport in college. He is currently uncommitted. 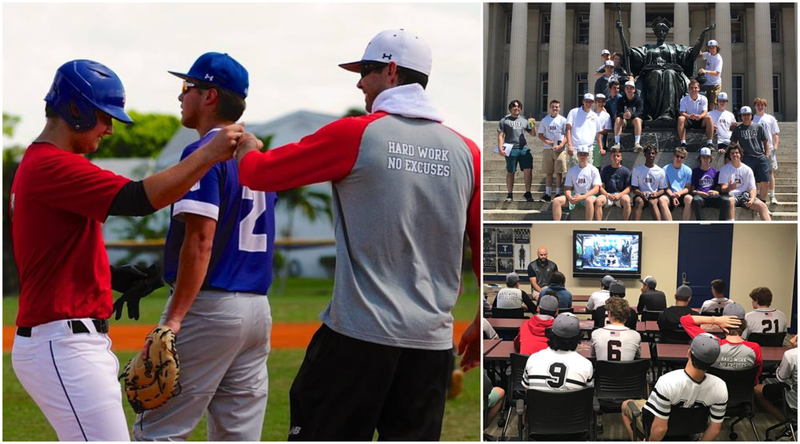 The Eagles program provides a number of recruiting resources and is committed to providing a year-around plan to finding the right academic fit for their players, even if they are not continuing their baseball career. Bradley and his staff also help players find a short list of schools by getting to know them and their interests. Along with college trips, the Eagles compete in local PSL games and participate in weekly training sessions and are still expected to keep a 3.0 GPA. The All-Academic team also requires at least a score of 1050 or 23 on their SAT and ACT scores respectively. The Bradley Eagles All-Academic team is part of NVTBL’s Premier Showcase League. For more information on the Eagles’ All-Academic team, visit their website at Bradleybaseballacademy.com. Bradley Eagles founder Andy Bradley strives to find the right academic fit for his players by targeting and exposing them to the right opportunities. PHOTOS PROVIDED BY THE BRADLEY EAGLES.